Baby Toolkit: Do Something Productive: Project Awesome Blobbies. Do Something Productive: Project Awesome Blobbies. On Tuesday night (one of the coldest of this icy year), 6 friends lugged sewing machines, fabric, and gear up our steep driveway while Jim cleared the ice. What inspired them to carry small appliances around on surfaces normally achieved only by Zamboni? At the end of MLK Day, I realized that I missed the boat on dedicating the any part of the day to public service. It turned out, I wasn't alone. Lots of friends with toddlers didn't find the time to serve (though they wanted to). My friend Karen has a gift for finding acres of nice fabric at low, low prices. When the Raptor was born she gave me enough soft flannel to swaddle our house (roof and all). We had discussed an evening of sewing something flannel for non-profits, but it never got off the ground. Two days later, buoyed by the inauguration, I started looking for a use for all that flannel. My first thought was Soule Mama's recent Mama to Mama sewing project for newborns in Haiti, but our materials were not recycled and all the deadlines had long since passed. After a few Google misses, I hit the motherload at CareWear.org- a nationwide, non-profit network of volunteers who provide handmade items for hospitals. Not only do they offer patterns and guidelines for crafting, they have a registry where hospitals can request items. I called Karen. We decided to make baby blankets and started scouring the hospital database for recipients. We even called our local hospitals, but their needs are presently met. Our state seems to have a lot of volunteer-ism, so there wasn't much need here for items we felt qualified to make. You might be wondering why we would want to make blankets for hospitals? Of course hospitals already have blankets, but those blankets can only be accurately described as institutional. The visually sterile environment can be hard on a parent if a child is admitted for any time longer than a regular maternity stay. In a neighboring state, Karen found a children's hospital with an urgent need for blankets. After a phone call for more details, we knew we had found our project. We decided to dedicate our time to better blankets. 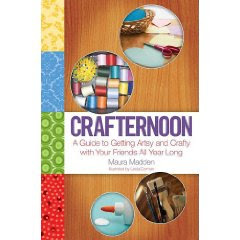 A recent reading of Maura Madden's Crafternoon: A Guide to Getting Artsy and Crafty With Your Friends All Year Long had convinced me to invite friends over for a game night (we have a big game closet and a craft night required far more supplies than I could expediently arrange). That night Karen and I invited our friends to join in the craftivism, and Project Awesome (as Jim dubbed it) was born. We set a date for a sewing night and people started gathering fabrics to use from their home stashes. In recent years, we have seen many fabric stores close, and I am always drawn to the bright, cheerful kid flannels. There was a lot to share. So, two weeks later (after the ice storm subsided, when power was finally being restored), six fabulous women came over for dinner and blanket making. In three hours we completed 11 blankets and cut cloth for over a dozen more. The house was filled with light and laughter despite the cold outside. This project has done a lot to warm my heart too. It's a wondrous thing to be able to give when the world seems so full of bad news and anxiety. Most of what we sewed was surplus yardage rather than new purchases, so we were able to give without spending extra. A few great folks have offered to help us with postage. The blankets brought back a lot of memories of our own kids' time in hospitals. One sweet boy in our group fought for his life in a local NICU. Other babies travelled to our state's major children's hospital for procedures. The days that Ranger spent in the local hospital when Rotavirus overwhelmed his skinny body were among the very worst of my life. We all liked the thought of brightening the atmosphere and offering a small measure of normalcy for families experiencing heart wrenching anxiety. Around Karen's house blankets are beloved "blobbies." When Karen's daughter heard about Project Awesome, she thought it would be better named Project Awesome Blobbies. Hospitals' need for blankets extends from tiny receiving blankets to crib size to lap blankets to twin sized because preschoolers, big kids, tweens, and teens are all served by their hospital. Older kids get a lot less attention than babies, but they like friendly blankets too- especially duing treatments. Apparently some of the kids will pass the time of their treatment counting and recounting the knots on knotted fleece blankets. We used a very easy (free) blanket pattern from Mama to Mama; it makes simple, but lovely blankets. Email me (babytoolkit [at] gmail.com) about your project (we love pictures) or send me a blog link if you decide to join in! I'll post an update in a couple weeks when we gather all the finished blankets, play games, and eat great food. What projects are warming your heart these days? This is fantastic! The book sounds great (I ordered from the library), and thank you so much for sharing about the blankets. What a great charitable opportunity!